Imagine setting this dazzling dish down on your holiday table. Come closer. Closer still. Come on, put those peepers right up to the screen. 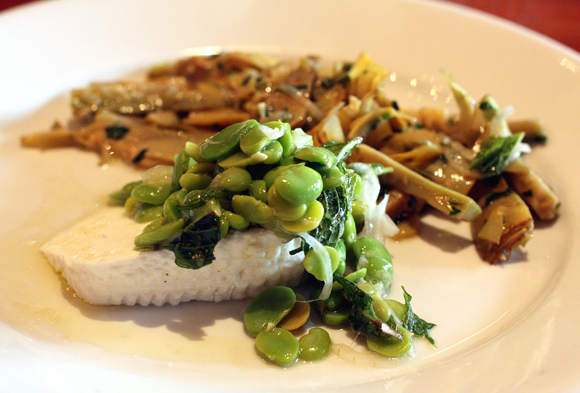 Of course, that’s not the actual name of this gorgeous dish. 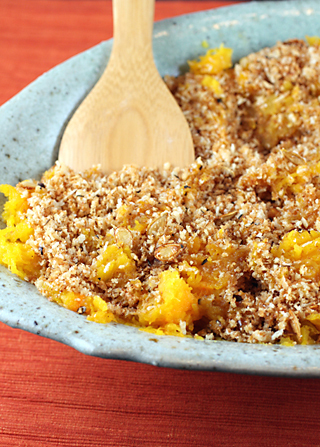 But it might very well be because this is the only squash recipe you’ll need this season. That’s how delicious it is. 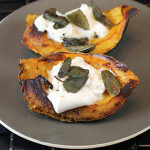 The recipe for “Kabocha Squash and Grilled New Onion Salad with Yogurt, Pomegranate, and Almonds” is from the new cookbook, “This Is Camino” (Ten Speed Press), of which I received a review copy. The 100 recipes draw from the cuisine of Camino, the soulful farm-to-table Oakland restaurant run by Chef Russell Moore, who cooked at Chez Panisse for 21 years, and his co-owner and wife Allison Hopelain. But to make things easy, the only thing you need to grill in this dish are the green onions. And if you didn’t want to start a fire in your grill just for that, you could easily use a grill pan on the stovetop instead. 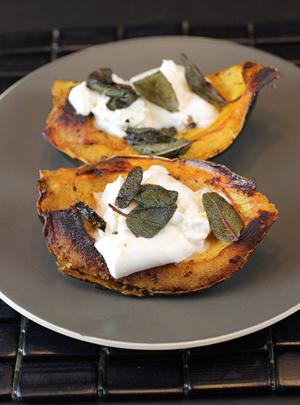 The recipe calls for kabocha squash. But I used red kuri, which is very similar in taste and texture, but is bright orange on the outside instead of deep green like a kabocha. Although the hard skin of both types of squash are edible when cooked, Moore directs that you peel it off for this dish. I think it looks more aesthetically pleasing that way, too. 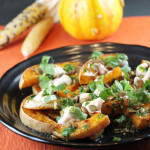 The squash wedges are steamed until creamy soft, then garnished with the blistered green onions, garlicky yogurt, and a perky sauce that’s almost like a Persian version of chimichurri. The sauce is a chunky blend of parsley, oregano, reduced pomegranate juice, toasted almonds and olive oil. It’s fruity, tangy, herbaceous, and unexpectedly vivid and bright. 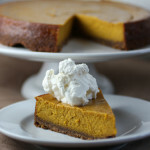 The sweet squash, with its chestnut-like texture, gets all dressed up in crunchiness, earthiness and festive flavors. 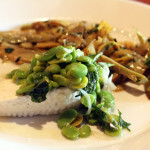 This is one of those miraculous dishes that’s so in balance that every ingredient plays an important and necessary role. 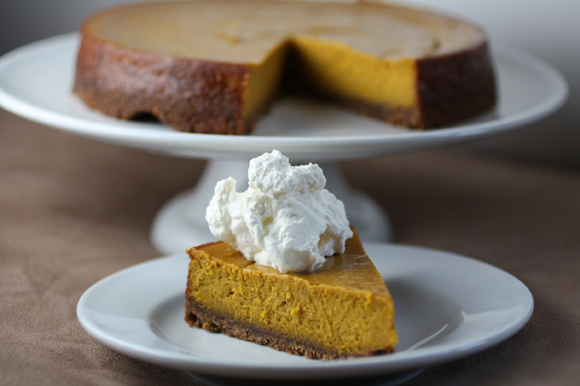 What makes this dish so appealing for the holidays is that you can prepare much of it in advance, especially since the squash is served at room temperature. Could you ask for a better squash dish? P.S. 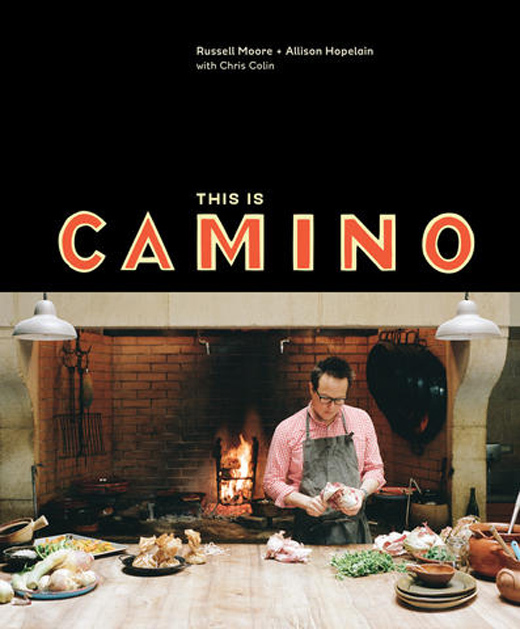 Camino is hosting a book party at Bar Agricole in San Francisco, 6 p.m. Nov. 10, featuring wine, cocktails and small plates. Tickets are $75 each. Build a fire to grill the spring onions. 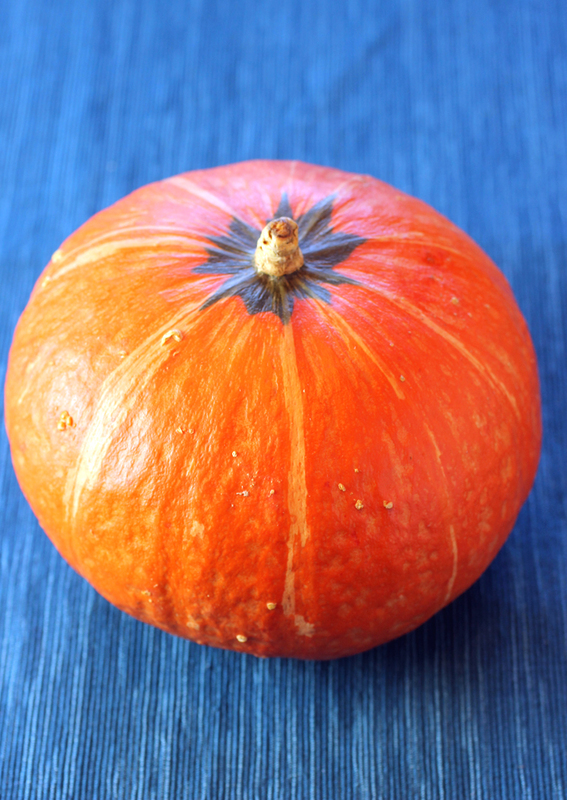 Peel the kabocha with a vegetable peeler, then cut it in half and remove the seeds. Cut into 3/4-inch-thick wedges, sprinkle with a pinch of salt, and arrange in a single layer in a steamer. Steam until just tender, about 20 minutes, then let cool to room temperature. Cut the spring onions in half lengthwise, leaving the roots intact to hold them together. Rake the coals under the grill for medium-hot grilling. Brush both sides with olive oil and sprinkle with salt. Place the spring onions cut side down on the grill and cook them until they are satisfyingly brown and have nice, dark grill marks, about 4 minutes. Turn them over and grill for another few minutes on the second side. Move them to a cooler part of the grill and pile them into little tangle to steam for 3 more minutes. Remove from the grill and let cool. Boil the pomegranate juice in a pot until it is thick and has reduced to about 1 tablespoon. While the pomegranate juice is reducing, spread the almonds on a baking sheet and toast them in the oven until they are a shade darker, about 8 minutes. Once they are cool, taste them to make sure they are crunchy. If not, pop them back in the oven for a few more minutes. Chop them coarsely and add to the reduced juice along with the parsley, oregano, a pinch of salt, and enough olive oil to cover the nuts and herbs. Peel the garlic and pound it in a mortar until smooth. Mix with the yogurt. 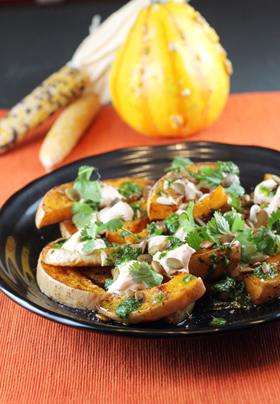 Spoon the garlicky yogurt onto a plate and arrange the steamed kabocha wedges on top. 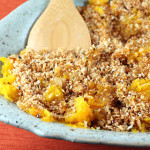 Drape the grilled spring onions over the kabocha, then spoon the herby, nutty, pomegranatey mixture on top. Looks lovely. Do you feel like a lot of the recipes recommend grill cooking? I don’t have a grill so not sure if I could make a lot of his dishes to be authentic like his wood-fire oven at the restaurant. I like his simple approach to food, though. 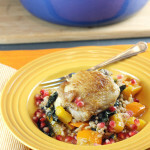 Instead of reducing the pomegranate juice, could I use pomegranate molasses instead? 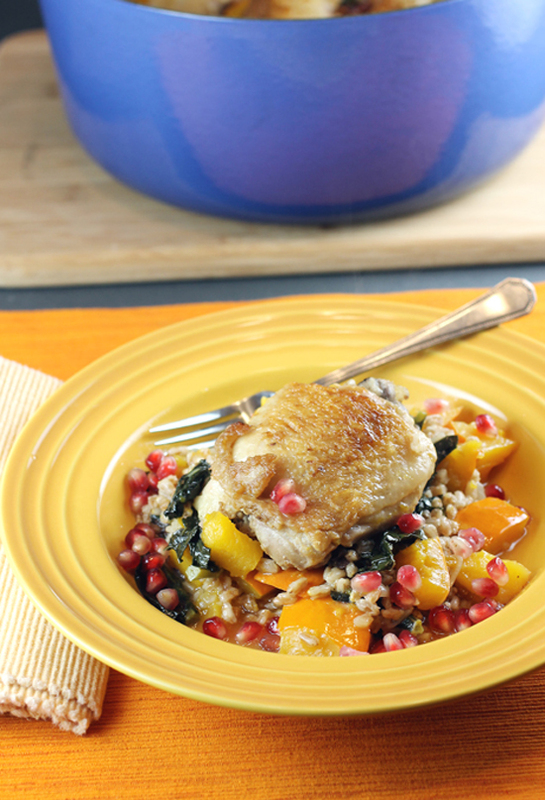 Lorraine: You can definitely use pomegranate molasses instead. In fact, I did that because I happened to have a bottle on hand that had all of a couple of tablespoons left in it. This dish was the perfect way to use it up. Ben: Quite a few of the recipes do require a grill. But you can always adapt them by using a grill pan or just cooking in the oven. You won’t get the char and smokiness, but I’m sure it’ll still turn out mighty delicious. 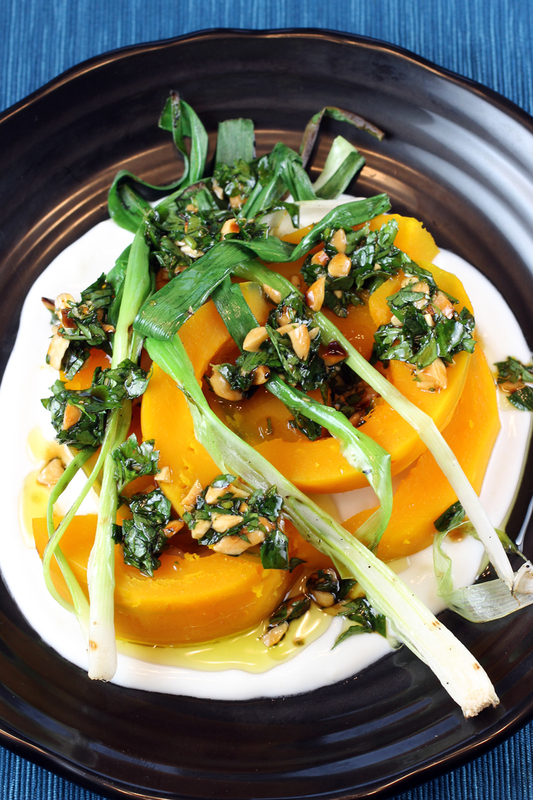 A seriously beautiful squash dish!